Do you need replacement parts for any of your Ksport Procomp Big Brake Kit? Sometimes you loose something, or need a backup part or two at the track. Here are a few popular replacement parts. These high quality stainless steel brake lines stop expansion under pressure, and are used only for the Ksport big brake systems. 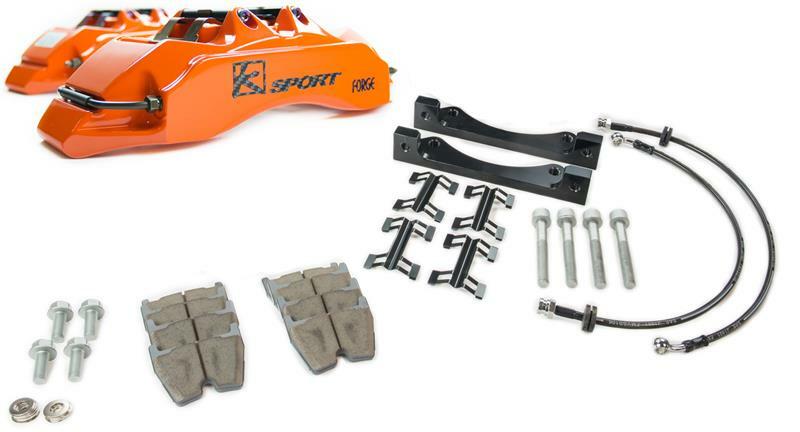 Replacement set of 4 pads for your ksport brake big brake setup. There are two different types of pads available. These NAOC ceramic pads are designed to give you the optimal braking performance under street and occasional track conditions. Optimal operating temperatures are between 194°F – 1022°F for fast warm up under normal driving conditions. These pads reduce the amount of brake dust by 50% or more when compared to our race pads. The SC5 pads also greatly reduce the amount of noise and wear on the rotor over the race pads. The average coefficient of friction on this pad is between .46 and .53. These carbon metallic race pads are designed to give you the best stopping power possible under extreme track conditions. Optimal operation temperatures are between 480°F – 1472°F so it is not recommended for street use due to high temperature needed for optimal performance. Replacement caliper mounting bracket for Ksport big brake systems.